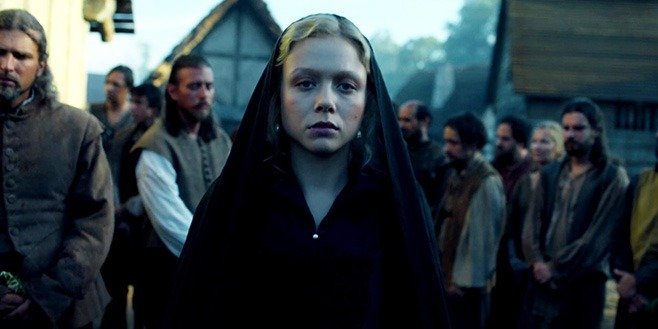 Joselyn, dressed in “widow’s weeds,” follows her husband’s coffin to burial outside the fort palisade in Season 2 of “Jamestown.” Courtesy of PBS. 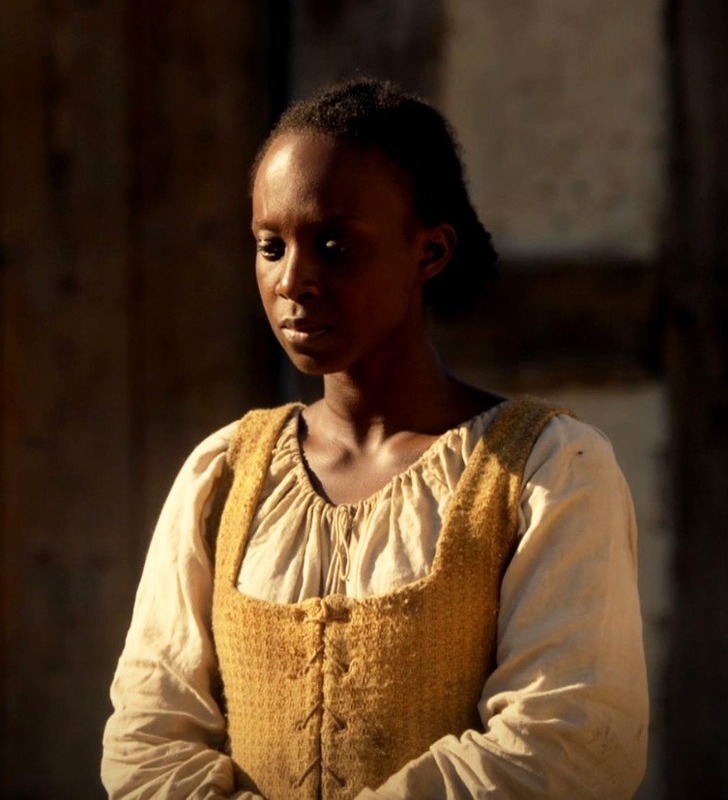 Season 2 of “Jamestown,” the British television series now airing on PBS (WHRO Passport in the Hampton Roads area), begins with an episode chock-full of the life experiences faced by women in the 17th century Virginia colony. Childbirth, widowhood and the heart-wrenching effects of forced migration are all viewed from the female perspective. Season 2 is taking place in 1620, the year when the actual women recruited as wives for the colonists started to arrive, although this event was cast as 1619 in Season 1 of the series. 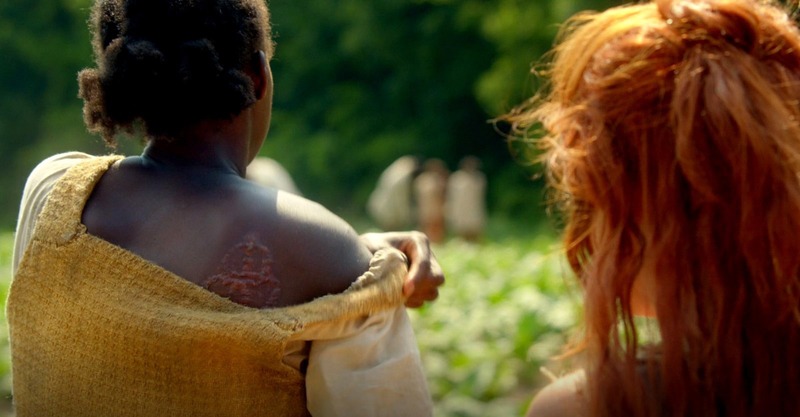 While “Jamestown” is historical fiction written for drama and general appeal, Bill Gallagher, the series’ creator, did his homework. His scripts contain snippets of real-life situations that are taken from the scant surviving records. Unencumbered by the need to create a historical documentary on Jamestown, Gallagher has used his imagination to color in the stark outlines of history, exploring the undocumented human emotions and situations that we might imagine were experienced by the men and women from different rungs of society and from diverse ethnic groups as they encountered each other in their new reality. Our understanding of 17th-century Jamestown and the expanding Virginia colony is overwhelmingly drawn from the writings of men. As illustrated in Jamestown Settlement’s new special exhibition, “TENACITY: Women in Jamestown and Early Virginia,” women’s lives were rarely documented. Pocahontas stands tall as the only Powhatan Indian woman we know much about until Cockacoeske, werowansqua or chief of the Pamunkey, elicits notice in the 1670s during the events surrounding Bacon’s Rebellion. Little is known about African women beyond the English households in which they worked and most are not even mentioned by name. English women fare slightly better in that many names are known, as well as scraps of information such as their dates of arrival, marriages and/or deaths. The “lucky” ones—those who have attained greater notice in the story of English America’s beginnings—usually have been guilty of some misbehavior or are otherwise involved in a court case. There is deafening silence when it comes to the thoughts and feelings of these early women as they interacted with each other and with the men in the colony who outnumbered them by six to one. In the English society transplanted to the New World, men made and enforced all the rules. Women were defined by their relationship to a man whether as an unmarried daughter (maid), a wife or a widow, and societal status could drastically change with shifts in these roles. Such is the case in Season 2: Episode 1 with Joselyn Castell whose husband, Samuel, has just been found dead. Lady Temperance Yeardley, wife of the governor, reinforces Joselyn’s new role in the Jamestown society by immediately bringing her black mourning dress. While today we associate “widow’s weeds” (from the Old English waed meaning garment) composed of black veil and dress with Queen Victoria and the 19th century, black mourning garments had been worn by upper-status individuals for centuries. At the time of Jamestown’s founding, this apparel was out of reach for all but the wealthy since black dye was expensive and difficult to produce, requiring multiple baths of iron salts and tannins on a dyed blue ground. Unheaded was of course referring to living without a man to guide and protect her. Women were considered physically and mentally inferior to men. Marriage, making women legal dependents of their husbands, was the norm and to live otherwise was a threat to the social order. Joselyn’s response to being unheaded—“my husband has died and it seems as though my head has been cut off”—is truer than she might like to think. The best option for a woman in Joselyn’s situation was remarriage and with the colony’s gender imbalance this was a likely outcome, especially for women who late husband had done well in colonial society. Marrying a widow with property was one way that a man could quickly increase his wealth and status. As revealed by her biography in the “TENACITY” exhibition, the real Temperance Yeardley was herself a widow when she married George Yeardley, a newly titled nobleman and incoming governor. One year after Sir George’s death in 1627, she married again and was owed—according to her new husband (interim Governor Francis West)—a share of her late husband’s estate worth £3,000 (more than $800,000 in today’s currency). As Mrs. West, Temperance ceded to her new husband the rights to property she brought into the marriage. The fictitious widow Joselyn Castell is not as lucky since she has no wealth to tempt possible suitors. Although her husband had status as Recorder for the Virginia Company, he was essentially a Company servant working for Secretary Farlow. After Samuel’s death, Joselyn’s Company-owned lodgings are needed by his replacement. Her belongings are summarily removed on the orders of Farlow who derides the widow’s condition by telling her it was too bad she hadn’t married a farmer because then she would at least own something. This treatment seems rather severe, but we have no details about how such situations would have been handled in the colony. Widows of unpropertied men would certainly have been absorbed into other households, for we know from the historical documents that a number of unrelated individuals in the early colony shared homes. Maria reveals that her real name is Njinga, which was the name of the Queen of Angola, homeland of Virginia’s first Africans. The Portuguese captors christened those they sold into the slave markets with Hispanic names. Courtesy of PBS. Another storyline in the first episode starts with the very pregnant Alice (wife of Silas Sharrow) accidentally tumbling down a riverbank and going into labor. Her friend Verity is there, but it is Maria, a young African woman, who rushes to Alice’s aid and delivers the baby. Maria’s character represents one of the first actual documented Africans to arrive in Virginia in late August and early September 1619. These men and women, kidnapped during political warfare in Africa, had been stolen by two English privateers from a Portuguese slave ship bound for New Spain in present-day Mexico. For reasons yet to be discovered, only one these individual’s names has been preserved—a woman named Angelo. Her name can be seen in two rare documents on view until January 5, 2020, in the “TENACITY” exhibition. These Virginia Company records, the Census of 1623-1624 and the “Muster of the Inhabitants of Virginia, January 1624-25” are in America for the first time, on loan from the National Archives of the United Kingdom. We know nothing about Angelo’s personal life, either in Africa or in Jamestown, but the character Maria expresses some of the painful emotions that must have been experienced by individuals like Angelo. Maria tells Verity, a taverner’s wife, about her two young children left in Africa and her hopes of returning to them. Verity tries to console Maria by telling her that she too had been forcibly taken far from home but that she had found a new life in Virginia. Verity’s character in the series represents the historically-documented group of vagrant and miscreant women who were shipped to Virginia from London’s Bridewell and Newgate prisons in 1618 and 1619. However, the Bridewell women were not actually part of the recruited brides. Rather, they were shipped to meet the colony’s labor shortage and most likely found themselves toiling in the tobacco fields. These women’s lives were difficult and usually quite short. “TENACITY” shares the story of one Bridewell inmate, Elizabeth Abbott, whose life in the colony lasted just six years before she was beaten to death with a whip tipped with fish hooks. Maria shows Verity her brand of slavery as a powerful illustration of why the experiences of the two women cannot be equated. Courtesy of PBS. Whereas Maria and Verity both suffered the emotional stresses caused by forced migration, the similarity ends as Maria bares her shoulder to reveal the brand inflicted when she was sold into servitude. Verity has no such brand. Their lives cannot be equated and will become even more distinct as the century wears on and race-based slavery begins to take hold. If this first episode is any indication of what is to come, this season promises to be quite exciting. It is refreshing to view the events of early Virginia from a female perspective, and it is hoped that more may be heard from the Powhatan women as the story progresses. Read more blogs about the “Jamestown” TV series, Season 1.